Fulham’s Andre Schurrle and Cyrus Christie have overcome injuries but Timothy Fosu-Mensah is ineligible against his parent club. Andre-Frank Zambo Anguissa, who has recovered from an ankle injury, could make the bench, as could new signings Lazar Markovic and Havard Nordtveit. There are likely to be changes to the Manchester United team with Tuesday’s Champions League tie in mind. Antonio Valencia and Matteo Darmian will be sidelined for a while longer. But Marcos Rojo is back in training. Fulham have won just three Premier League matches against Manchester United, losing 19 times. United are unbeaten against Fulham in their past 11 meetings in all competitions (W9, D2). Manchester United have won seven of their past eight matches, the best record of any Premier League side over that spell. They have taken 22 out of 24 possible points since Ole Gunnar Solskjaer took over and are the only unbeaten club in the Premier League during that time. United are looking to win six consecutive away games in all competitions for the first time since May 2009. Paul Pogba has been directly involved in 11 goals in eight Premier League appearances under Ole Gunnar Solskjaer, scoring six and setting up five. Crystal Palace defender James Tomkins misses out with a calf strain, while Cheikhou Kouyate has an ankle problem and Connor Wickham is also ruled out. Wilfried Zaha returns from suspension, having decided to appeal against an additional one-game ban. West Ham forward Marko Arnautovic has recovered from the foot injury that saw him miss Monday’s draw with Liverpool. Samir Nasri, who has missed the Hammers’ last two games with a calf injury, is not yet ready to return. West Ham are unbeaten in seven league meetings (W4, D3). Palace are without a win in their last four home games against West Ham (D1, L3). Huddersfield winger Isaac Mbenza could be out for up to six weeks after tearing a calf muscle. Chris Lowe should be fit after illness, while Jonathan Hogg and Erik Durm are back in full training after injuries. Arsenal’s Henrikh Mkhitaryan, out since December with a foot injury, could return, with Granit Xhaka and Ainsley Maitland-Niles also back in training. Pierre-Emerick Aubameyang and Laurent Koscielny are expected to have recovered from sickness. Arsenal have won all three Premier League meetings, scoring seven goals without conceding. Huddersfield’s last win over Arsenal was back in 1971, when they won 2-1 at the old Leeds Road ground. This fixture last season – which Arsenal won 1-0 – was Arsene Wenger’s 1,235th and final game as manager of the Gunners. Arsenal have lost four and drawn one of their last five away matches in the Premier League. Their last win away from home came at Bournemouth on 25 November. The Gunners are the only side yet to keep a Premier League clean sheet away from home this season. They have lost 12 of their past 20 away league games, with their sole clean sheet during this sequence coming in a 1-0 win at Huddersfield last May. Liverpool trio Jordan Henderson, Georginio Wijnaldum and Trent Alexander-Arnold have all returned to training after injuries and could be involved against Bournemouth. Dejan Lovren is not yet ready to play. Bournemouth remain without injured pair Callum Wilson and David Brooks, while Jefferson Lerma’s ankle problem will be assessed. Dominic Solanke is likely to start against his previous club, but loanee Nathaniel Clyne is ineligible. Liverpool are unbeaten against Bournemouth at Anfield, registering five wins and a draw in all competitions. Bournemouth’s solitary victory in 14 attempts against Liverpool was a 4-3 Premier League triumph at home in December 2016. Liverpool are on a club Premier League record run of 33 consecutive home matches without defeat. They have won eight of their past nine league games at Anfield. Their tally of 62 points is the second highest in the club’s history after 25 games of a season. They had 63 points at this stage in 1987-88. The Reds could score first and fail to win in three consecutive Premier League games for the first time. Liverpool have dropped seven points in their last five league fixtures, having only let slip six points in their opening 20 matches this season. Southampton’s leading goalscorer Danny Ings has been ruled out for up to three weeks with a hamstring injury. Ryan Bertrand is available after three months out because of a back problem, Maya Yoshida has returned from Asian Cup duty and Pierre-Emile Hojbjerg is back after concussion. Harry Arter returns for Cardiff, having been ineligible to face his parent club Bournemouth last weekend. Victor Camarasa may be fit after injury but Captain Sean Morrison remains out. Cardiff won on their most recent visit to Southampton, a Premier League encounter in April 2014, to end a 13-match winless away run in this fixture (D3, L10). The Bluebirds are vying to record three consecutive victories against Southampton for the first time since March 1963. Ralph Hasenhüttl’s first game in charge of Southampton was a 1-0 defeat in December’s reverse fixture. Watford are hopeful Abdoulaye Doucoure will be available after missing the last four games with a knee problem. Kiko Femenia should also be fit following a hamstring injury, but Roberto Pereyra, Isaac Success and Sebastian Prodl remain sidelined. Everton are again without injured pair Leighton Baines and Phil Jagielka. Yerry Mina is doubtful with a foot problem that is being monitored, while Richarlison and Gylfi Sigurdsson will hope to earn recalls. Watford have won their last two home games against Everton – they’ve never won three consecutive Premier League home matches against a particular opponent. Everton have lost just two of the 11 Premier League meetings (W6, D3). 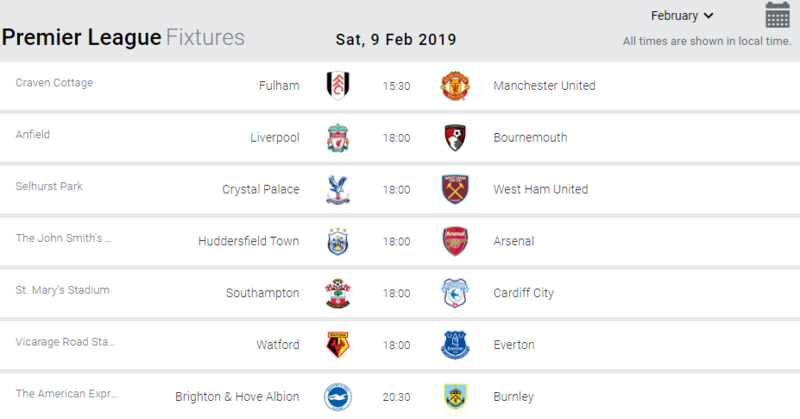 The Toffees have won five top-flight games at Watford – only Liverpool and Manchester United (seven wins each) have better records away to the Hornets. Brighton will assess Dale Stephens, who was a late withdrawal against Watford because of a hip problem. Striker Florin Andone has been charged with violent conduct after appearing to elbow an opponent in midweek, leaving him at risk of a three-match ban. Winger Jose Izquierdo has returned to training following a knee problem but is unlikely to be involved. Burnley midfielder Steven Defour is again set to miss out because of a calf injury. Full-back Matt Lowton will have a fitness test after recovering from a cracked toe bone. This will be the fourth meeting between the sides in the top flight. Burnley are unbeaten in the previous three (W1, D2). Brighton are winless in their last six games against the Clarets, although five of those matches were draws – a sequence which ended with Burnley’s 1-0 win at Turf Moor earlier this season. Tottenham will still be without Harry Kane and Dele Alli. Kane (ankle) is progressing well but the earliest he could return is the trip to Burnley on February 23, while Alli (hamstring) is also out. Ben Davies (groin) remains sidelined with Eric Dier (virus) and Vincent Janssen (knee) absent. Leicester will be without Marc Albrighton, who could miss the rest of the season with a hamstring injury, and Daniel Amartey (ankle). Tottenham have won three of their last four Premier League games against Leicester City (L1), winning the last two in a row. They haven’t won three consecutive league matches versus the Foxes since February 1987. Leicester failed to score in the reverse fixture against Spurs, losing 0-2. They last failed to net in two consecutive league games against the Lilywhites in November 2000. Leicester have won just one of their last 11 Premier League away games in London (D4 L6), beating Chelsea on their last such visit in December. Tottenham have set a new Premier League record of going 29 Premier League games without a single draw. The last top-flight team to have a longer run were Portsmouth between March 1928-February 1929 (38 games). Tottenham have lost three of their five Sunday Premier League games this season (W2), including their only previous one at home so far (0-1 vs Manchester united). Leicester are one of just three non ‘big six’ sides to have won away against such a team this season (1-0 vs Chelsea), along with Wolves and Crystal Palace. Leicester’s Jamie Vardy has been directly involved in seven goals in his last seven Premier League appearances against Tottenham (4 goals, 3 assists), netting three goals in his last two against them. Heung-Min Son has had a hand in 14 goals in his last 11 starts in the Premier League for Tottenham, scoring 10 and assisting four. Manchester City are still without defenders Benjamin Mendy and Vincent Kompany for the visit of Chelsea. Left-back Mendy, who has missed the last four games, is being managed carefully as he returns from knee surgery and captain Kompany is still troubled by a muscular problem. Goalkeeper Claudio Bravo (Achilles) is still out long term but City have no fresh injury concerns. Antonio Rudiger could return to Chelsea’s starting line-up at Manchester City. Defender Rudiger was not risked in last week’s 5-0 win over Huddersfield due to a knock, so Andreas Christensen deputised. The Denmark defender is likely to make way. Callum Hudson-Odoi has been ill, so may not even be among the substitutes. Man City have lost three of their last five Premier League matches against Chelsea (W2), scoring just four goals and never more than once in this run. Chelsea have won on just two of their last nine visits to the Etihad in the Premier League (D1 L6), winning 1-0 in February 2014 and 3-1 in December 2016. Man City boss Pep Guardiola has lost more league games against Chelsea than he has versus any other team in his managerial career (3). Man City striker Sergio Aguero has scored five goals in his last five Premier League appearances versus Chelsea, including netting a hat-trick in April 2016. Chelsea’s Eden Hazard has had a hand in five goals in his last five games against Man City in the Premier League (3 goals, 2 assists), with the Belgian assisting both of the Blues’ goals in the reverse fixture this term. Sergio Aguero has scored 11 goals in 11 home Premier League games for Manchester City this season, including two hat-tricks. He’s the highest scoring home player in the competition so far this season. 50% of N’Golo Kante’s Premier League assists for Chelsea this season have been for Gonzalo Higuain (2/4), despite the pair playing just 148 minutes together. Wolves have been on a training camp in Marbella ahead of Monday’s visit of Newcastle. Diogo Jota missed Tuesday’s 3-2 FA Cup replay win over Shrewsbury with a knock but is expected to return, along with Ruben Neves, who was on the bench. Ruben Vinagre missed the game due to a virus but should also be available for Nuno Espirito Santo’s side, who travel back from Spain on Sunday. Newcastle boss Rafael Benitez has decisions to make ahead of the trip to Wolves with record signing Miguel Almiron available for the first time and his injury list having decreased. Almiron could make the squad after training with his team-mates since Wednesday, while goalkeeper Karl Darlow (elbow), defender Paul Dummett (hamstring), midfielders Mohamed Diame (hip) and Ki Sung-yueng (hamstring) and striker Joselu (ankle) are fit and frontman Yoshinori Muto is back from the Asian Cup. Wolves, who won the reverse fixture back in December, are looking to achieve a league double over Newcastle for the first time since the 1991-92 campaign. Newcastle have lost only two of their last 10 meetings with Wolves in all competitions (W4 D4). Newcastle are unbeaten in their last four away games against Wolves in all competitions (W2 D2), winning the last two. They have never won three consecutive away matches against Wolves. Wolves have lost all four of their Premier League games played on a Monday, last winning such a top-flight match in May 1984 (1-0 vs Leicester). After a run of 10 straight Premier League defeats in games played on Monday, Newcastle have won two of their last three such matches, including their last one at Burnley in November. Wolves are looking to win four consecutive top-flight games for the first time since January 1972. They’ve scored a total of 10 goals in their last three games Newcastle have won six points from their last three Premier League games (W2 D0 L1), as many as they had in their previous nine in the competition (W1 D3 L5). Raul Jimenez is Wolves’ highest Premier League goalscorer this season with nine. He could become just the second Mexican player to reach double figures in a single Premier League campaign (Javier Hernandez in 2010-11, 2011-12 and 2012-13). João Moutinho has registered five assists in his last three Premier League games, providing the assist for 50% of Wolves’ total goals in that time (5/10). Jose Salomon Rondon’s six Premier League goals have been worth nine points to Newcastle this season, with each of his goals being worth at least one point in every game he’s scored.